With a pedigree stretching back to the founder of Finnish free jazz, Edward Vesala, Tapani Rinne/Tero Majamäki has, over the years, consorted with multiple musicians from his homeland, winning many Finnish awards for his achievements. The main vehicle for exploring his claimed territorythe borders of experimental and techno-jazzhas been RinneRadio, featuring percussionist Juuso Hannikainen and electronicist Verneri Lume. Over 23 years, Rinne has recorded over 15 albums with the band, while maintaining a steady output of solo recordings as well. 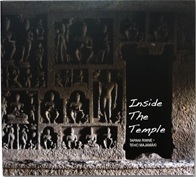 Inside the Temple is the fourth of these solo efforts, where Rinne works with fellow-Finn/percussionist Tepo Majamäki, playing udu and santoor. The terrain is very familiar, as Rinne's music is often described as sparse or ambient, but the territory is very different. Forsaking the electronic facilities of the studio for on-site locations in two sacred Indian caves and one temple, the recording is essentially a live album, with the spirits of the location very much in attendance. The feeling of this music is spartan, with Rinne exploring his E-flat and bass clarinets to sparse accompaniment from Majamäki or from resident fauna. The sound is thus contemplative to the point of absolute minimalism. "Vibhav" starts with the extended and very distant cooing of local doves, before Rinne takes up his solo to the accompaniment of a distant passing jet and Mäkinen's sporadic taps and booms on the udu. Rinne has never laid great claims to being an ethno-jazz musician, but in fact has regularly worked with traditional folk musicians like Sami Yoik singers Wimme Saari and Ulla Pirttjärvi, and throat singer Imre Peemot. But using the natural cadences and harmonics of the locations along with a little recording expertise, the timbres and feeling of this music link straight to the RinneRadio songbook (as in his "Day and Night") and just as directly to the traditional Indian precept that sound "Nada" lies at the heart of all existence. Track Listing: November, Vibhav, Temple of Sound, Udu, Panorama, Day And Night, Song For My Aunt, Breathe and Touch, Flow. Personnel: Tapani Rinne: E-flat clarinet and bass clarinet; Teho Majamäki: udu and santoor.